Oldcastle Infrastructure provided an innovative pedestrian tunnel solution for International Speedway Corporation’s Richmond Raceway Reimagined project. The $30 million infield redevelopment will consist of modern attractions and amenities that complement the racing experience for which Richmond Raceway is known. The new and improved design of the pedestrian tunnel is wider, providing fans with a more comfortable way to access the updated infield. The new tunnel also includes an elevator for added convenience and ADA accessibility. Recognizing the benefits of precast, the project team selected precast concrete box culvert segments as the best solution to construct the pedestrian tunnel. The General Contractor Barton Malow contracted Oldcastle Infrastructure’s Fredericksburg, VA, location to design, engineer and manufacture the 49 precast concrete box culverts used to create the 415-foot tunnel. Of the box culvert segments produced, three were designed to elevate the walkway upward to get the tunnel back to the concourse level. To construct the pedestrian tunnel, a portion of the racetrack was removed, the area was excavated, and the foundation was prepared for the installation of the precast concrete box culvert segments. The final assembly of the 10×10 precast box culvert segments is comprised of 6,506 cubic yards of concrete, 220,326 square feet of slab, and 256,000 pounds of rebar. It measures 415 linear feet and weighs 1,100 tons. 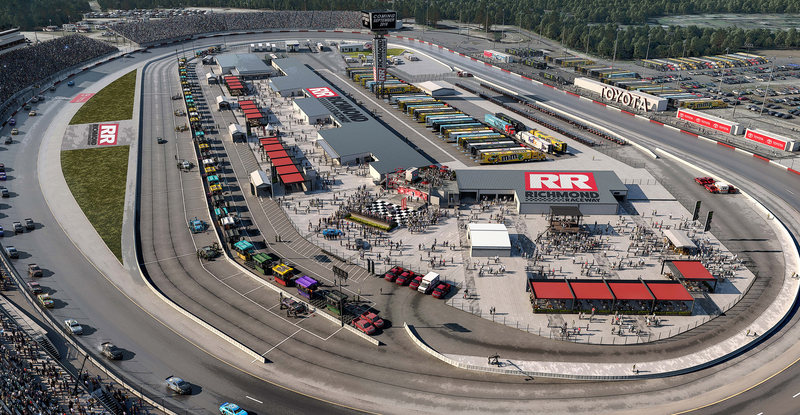 Construction continues at the Richmond Raceway, which is expected to be completed by September 2018, in time for playoff races for the Monster Energy NASCAR Cup and XFINITY Series.